Hire Pros Home Services and give your kitchen a brand new look. 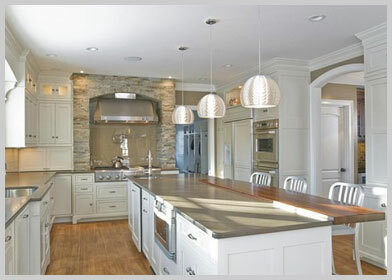 We are considered among the best kitchen contractors in the city of Boston. 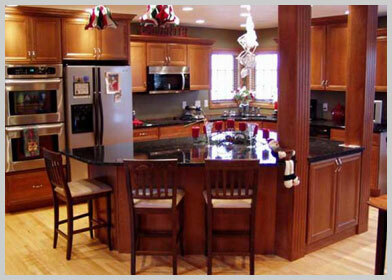 Why, well that’s simple, our professionals are well acquainted with all the latest in kitchen remodeling processes. We make sure that you get the best quality renovations for your kitchen, according to what you desire. With a wide variety of styling options and designs you can choose from us, you can personalize your kitchen anyway you want and leave the rest to us. Our experts will make sure that your new kitchen gives you a pleasant cooking experience. We are well aware of how a house’s resale value increases just by remodeling a kitchen. Our experts will give your kitchen that eye-catching look, something that will surely make anyone feel good when using it. Our Kitchen contractors MA specialize in giving your kitchen a facelift, thereby making you feel better whenever you cook there, we add the much needed vigor and vibrancy needed for a kitchen to appear comfortable and highly functional at the same time. Our remodeling services will allow you to add more sale value to your house, thus making it more valuable in the market. Studies suggest that the kitchen is the first thing any potential buyer seeks upon inspecting a home. This is why kitchen contractors MA emphasize on making your kitchen area more appealing for anybody. So, hire our services and give your kitchen a noticeable rise in value. We are experts in making your place appear larger. And this is thanks to our cutting edge technology, equipment and resources we are able us to renovate your kitchen add more space to it. This is best for a newlywed couple who has just moved into a new house or a big family. Our experts will make sure that your newly refurbished kitchen best satisfies the needs of your growing family. Kitchen contractors MA provide you numerous options related to adding new cabinets, drawers or slide-out pantries, so that you can have enough room for standing and sitting while cooking delicious food or cleaning up. Our kitchen remodeling process entails a great degree of flexibility for cooks and homeowners so that they are able to utilize their pantries to the maximum. We also offer the homeowners the chance to create walk-in pantries so that they are able to go through the entire pantry in a short amount of time. We recommend that if you already have space in your kitchen then do try to avail this service as it will let you have more convenience for your activities in the kitchen. All in all, our kitchen’s remodeling will surely add value and increase the convenience to your living space, so do hire our kitchen contractors MA and make your place special. Pros Home Services has been providing exterior and interior home services to homeowners and businesses throughout Massachusetts. Take advantage of our great coupon discounts, click below!